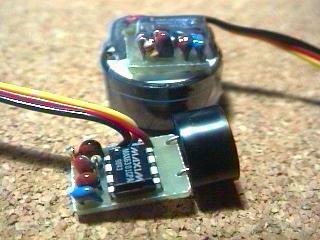 This device of my design uses a MAXIM chip to monitor both the system voltage and the transmitter signal. The device is intended to monitor microprocessors and the voltage supply for the processor a low voltage condition trips a reset, and a lack of a software signal at a set interval also trips a reset. This makes a very simple and reliable low voltage alarm and pulse omission detector for our purposes warning of a nearly depleted receiver battery pack and helping us find our planes in the weeds. R1 and R2 bring the battery voltage into range of the comparator (with internal reference of 1.22 volts), and C2 smoothes the servo-motor low voltage spikes in the ambient system voltage. C3 sets the reset period for the pulse omission detector to about 1/3 second. C4 sets the timeout period of about 30msec for the pulse omission detector, just greater than the normal transmitter pulse rate of 20msec. The result is a continuous tone for voltages less than the threshold, and a pulsed tone for the pulse omission detector alarm. I have had this system in about eight ships (all except my HLG and electrics) for the last year, and the thing works beautifully. Most of mine are mounted over a hole in the fuse directed down, below the wing saddle area (fore or aft of the ballast area), making it easy to hear while the plane is in flight. The slightly different configuration for 5 cell battery packs is listed in the table below. For the ultimate in protection, you can rig an additional battery so that you can still find your plane if the main flight battery fails or is ejected in a hard landing. Get the details here. Configuration for Battery Size: Most R/C on-board batteries are four-cell NiCd, but some folks like to use five cells to boost servo response time and power. The table below details the parts to use for each configuration, and shows where in the battery discharge voltage curve the alarm will turn on and off (showing hysteresis). 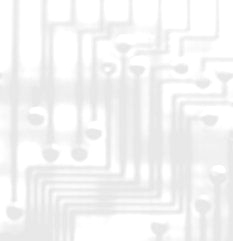 Maxim IC parts: The Maxim web site is http://www.maxim-ic.com. Phone orders and availability 1-888-629-4642, for free samples and literature 1-800-998-8800 . They used to get a little miffed if you tried to order less than 25, but I think one can order smaller numbers now. They will also happily send you a couple free samples. Information about the MAX6301 chip is here. This is a relatively unique product, and I’ve not been able to find it through the regular electronics distributors. Nope, Radio Shack definitely does not carry this item or anything remotely like it. Conventional PCB parts: Digikey (1-800-344-4539) part numbers: Digikey does sell the peizo buzzers, but they are much more expensive than those at Radio Shack and are larger as well. In addition to shipping, there is a $5 processing charge if your order is less than $25. Tantalum capacitors are physically smaller, but any composition will work. The tantalum capacitors are polarized at the small voltages used here the polarity probably does not matter, but if you think of it, solder it in with the "+" in the direction outlined in the drawing above. The 1/8 watt resistors were the smallest I could find without going to a surface mount type resistor, but any power rating will work as the current involved is extremely small. Surface Mount Parts: These are alittle harder to locate, as apparently Digikey does not sell as many as the regular components. They will have some of the right value and size in stock, but you may have to search for a different part number. Search for the part using the key words below under "Search". The "1206" is a surface mount package size, and "CT" is "cut tape" for 10 at a time, rather than 4000 or so on a reel. Check that "Quantity Available" is enough after you do the search. RadioShack Parts: Radio Shack. (1-800-843-7422) You can visit your local store, call, or order on the web. 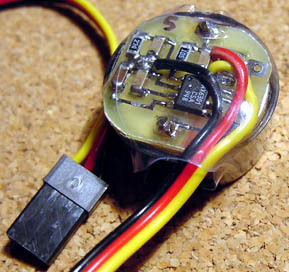 If your RadioShack is out of stock, you can pick up the larger buzzer from one of the regular parts suppliers as well. Looks like the CUI CEP-2202A (http://www.Digikey.com 102-1116-ND) and the Projects Unlimited AI-256 (http://wwww.Mouser.com 665-AI-256K) are essentially the same as the RadioShack 273-065. There are many other piezo buzzers from these suppliers as well. Buy One Built From Shepherd Products: From time to time, I build a batch of these things for my planes and the other guys that fly planes with me. Invariably, I have a few extra built and a few extra circuit boards. If you are interested in a ready made and tested Slope Shepherd, or in a parts-ready circuit board, send me an email (see the home page) to check availability. The Slope Shepherd is $30 for a complete unit with $8 shipping for any number (US only, trackable carrier), and the printed circuit boards are $5 each with $2 shipping for any number. I do not have any of the other devices on this site available. Payments can be arranged through Paypal, cashier's check, or money order.